Automatic boxes were later installed in some locations, and over time proved to be more effective. Automatic boxes consist of a lever that a person simply has to pull down to sound the alarm. If the wires were in good shape, there was very little room for error. In the crank boxes, however, many times people would get overexcited and turn the crank too quickly or the wrong way, disregarding the instructions above. This would send a muddled single to the fire department, and the officers would have to wait until the alarm was sounded again to act. Although it was a rare occurrence, if two crank boxes came on at the same time, the officers were unable to decipher which alarm came from which box. 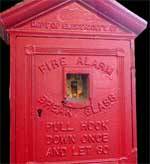 The crank boxes provided room for human error, and the fire department eventually opted for all automatic boxes.